Robert of Fully Charged travelled to Bruck, a small town about 40 Kilometres South East of Vienna, to find out about a community energy system that produces more electricity than the town consumes. The VERBUND wind farm at Bruck/Leitha is situated in the municipality of Bruck an der Leitha in Lower Austria. It was acquired in 2009 by Wind Power Austria, a wholly owned subsidiary of VERBUND Renewable Power. The wind farms Bruck an der Leitha, Hollern and Petronell-Carnuntum have been owned and operated by VERBUND since the beginning of 2009. The wind farms are located approximately 45 km from Vienna in the district Bruck an der Leitha. 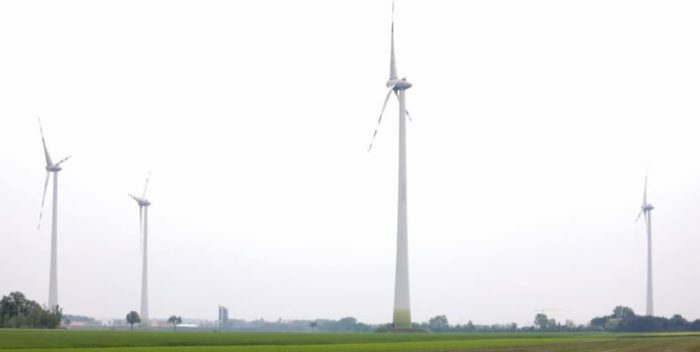 That which began back in the year 2000 with the wind farm Bruck an der Leitha has now become an exemplary model for regional, climate-friendly electricity generation. In 2004, further wind farms were constructed in Hollern and Petronell-Carnuntum; as a result, today, 25 rotor blades with a total capacity of 49 MW supply approximately 29,000 households with environmentally friendly electricity.